The last two days have been the busiest my blog has been (by a long shot) since I set it up in March 2011. Thank you for that support and thank you also for the many kind comments that have been made by readers about what I have been saying. My open letter to Ben Bradshaw yesterday was greeted by quite a lot of support but not everybody agreed with what I have written – see here for the letter and the comments below it. In particular I have been chided for suggesting the use of Parliamentary procedure to block the mandate of the Referendum as this undermines the democratic process. I gave a link in my blog yesterday to an article by the UK Constitutional Law Society which set out why such a process was legitimate – see here. Since then I have come across another analysis of referenda, polls, petitions and democracy by another Exeter resident Tom Staniford – you might (or might not) be interested in what he has to say – se here. I have also been asked my view on the piece that George Monbiot wrote for the Guardian yesterday “Brexit is a disaster, but we can build on the ruins” – see here, it is well worth a read. The first thing George does is reject the notion that the Referendum result should be overturned by the holding of a second Referendum (as called for in this Parliamentary Petition which has been signed by over 4m people – see here) and he rejects the approach David Lammy is campaigning for. He also says it will not happen. He then goes on to urge us to seize the moment “How will politics in this sclerotic nation change without a maelstrom? In this chaos we can, if we are quick and clever, find a chance to strike a new contract: proportional representation, real devolution and a radical reform of campaign finance to ensure that millionaires can never again own our politics”. 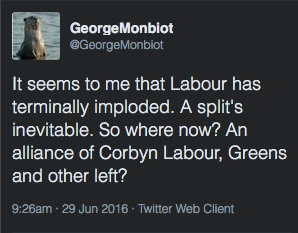 I don’t disagree with George’s vision, indeed I support it but it also what the Left and Centre Left have been fighting for, for years. 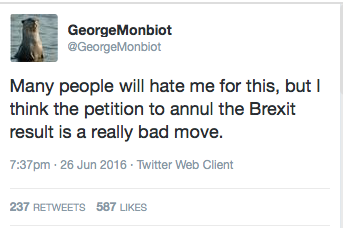 However many of the key players who might be able to deliver what George is advocating are currently otherwise occupied. 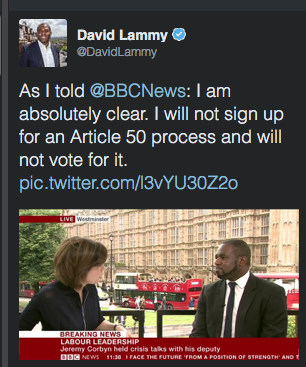 George may be right, David Lammy may be right but I suspect that there are many twists and turns still to come. Currently there are no answers and only chaos. Time to burrow back into nature, me thinks. This entry was posted in Europe and tagged Brett, David Lammy, George Monbiot. Bookmark the permalink. I am reading your reports with keen interest. Thank you for the information. Really interesting perspectives which show both sides of the debate. Thank you. My own view has always been that a single referendum was a silly idea – there should have been say one a year for 5 years with each one asking In/Out/Renegotiate, with Renegotiate winning by default unless there was a clear majority for one of the other two. This more nearly reflects negotiation in the real world, though probably not in the political world. Tom Staniford’s article is particularly interesting. I think that many of the legal arguments are overridden by the fact that most MPs agreed to abide by the result, and would accept the “will of the people”, regardless of their personal preferences. But his point that we didn’t know what Brexit means (ie do we withdraw altogether, or do we leave then sign up to so much that we might has well remained) is important. Ideally, especially given the disquiet amongst other EU countries, we should renegotiate, and would perhaps get the EU on a better footing – a looser confederation of countries and not moving towards the United States of Europe. This course seems to have been ruled out by the EU at the moment – they don’t want to renegotiate until we sign Clause 50, by which time it is too late. Therefore TODAY there seem to be two options – capitulate to the EU and say we don’t want to leave after all, or invoke clause 50 and leave (as Monbiot suggests). Capitulating would be wrong – it would negate the whole referendum and reduce trust in politicians to zero. Since we have a couple of months or so before we get a new Prime Minister, maybe things will have calmed down sufficiently for the EU to see the sense of a renegotiation before clause 50 is invoked. 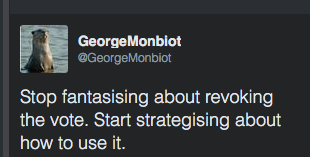 But in that time we must all plan for the fact that we will probably leave, and that we should “start strategising about how to use it” as Monbiot said. Thanks for this Stephen – I am pleased my blog has allowed us both to express our views. That is healthy and positive – where we go from here is still massively unclear – tomorrow is another day …..
First, thank you for your well reasoned views: it is heartening that good people are trying to make sense of this complex situation. The idea of a single in or out, in retropect, was bound to be disastrous. It made no sense for a decision of this importance to be decided on a (nearly) 50% vote leaving half the country unsatisfied. There are so many issues: there is the possibility of loss of the union of Britain over again: full control of immigration is no more possible (or acceptable) than it was before and there seems to be only a vague promise of full restoration of our financial strength after a clause 50 signing. Any action on the basis of a close vote, potentially for the forseeable future, had to be dangerous especially when so many people were apparently unclear about the issues involved , and the prejudices which have crawled out of the darkness since June 23rd must fill all reasonable people with concern. Now I feel in honesty, that all we can do is try to understand what has happened and hope to mitigate damage to our country and its friends. I hope there is a solution which will satisfy a larger majority this time.